Areis:- Today you are under magic spell of hope. Don’t spend too much on entertainment or cosmetic improvement. It is high time to change your dominating attitude in family. Work in close cooperation with them to share the ups and downs of life. Your changed attitude will give them unlimited joy. Only by clearly understanding you can give emotional support to your wife. You will be honored for some of your good deeds today at work. A day when events will be good and disturbing-leaving you confused and tired. This day is like the spring of your life; full of romance, just you and your better-half. 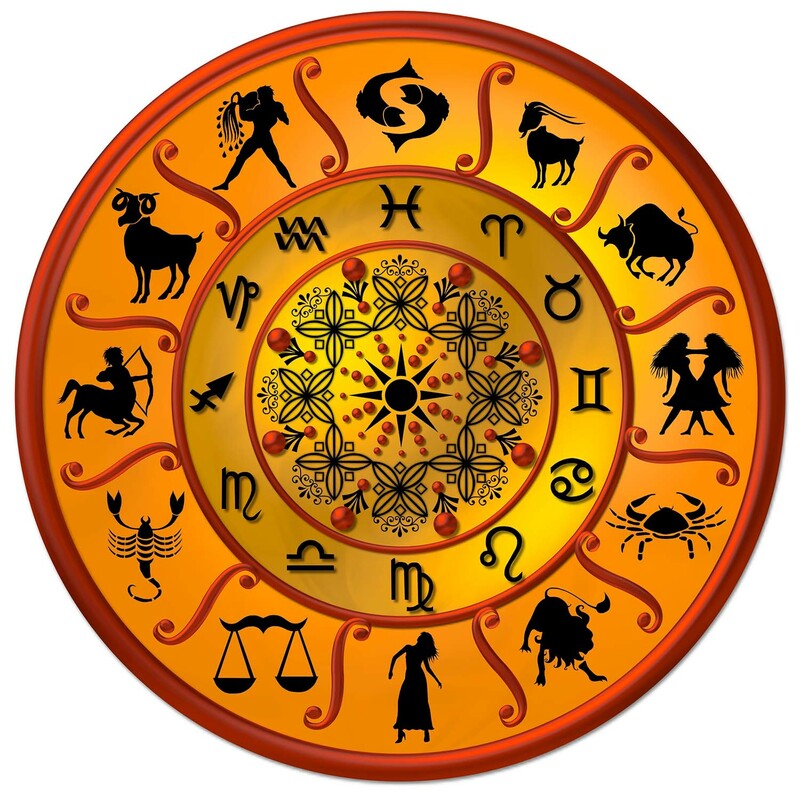 Taurus:- Performance of your child may give you immense pleasure. Today’s formula for success is to put your money on the advice of people who are innovative and hold good experience. Fix up something exciting and entertaining for the later half of the day. Love and romance would keep you in a happy mood. Do not sign any business/legal document without reading between the lines. Take care of your action and words as authority figure will be less understanding if you do something deceitful. Your spouse will show his/her angelic side to you today. Gemini:- You may get rid of your tension. Don’t overspend too much in order to impress others. Share your happiness with your parents. Let them feel worthwhile as feeling of loneliness and depression are erased. What do we live for if it is not to make life less difficult for eachother. Good day for romance. Successful day for those in the creative fields as they receive long awaited fame and recognition. If you run from a situation- it will follow you in the worst possible way. Today, you will realize that how much you mean to your better-half. Cencer :- Your rash behaviour may spoil the relationship with wife. Think the repercussions of your behaviour before doing anything silly. If possible go away to change your mood. Although your financial position improves but the outflow of money will still create hindrance in executing your projects. Youngsters may seek some advice on school projects. Love life could be little tough. You might meet a wonderful person at work today. Your flair to convince others will pay rich dividends. Rudeness of your spouse might keep you upset throughout the day. Leo:- Health remains good. You are likely to earn through most unexpected sources. Relatives will share your sorrow. Feel free to share your problems with them. You will definitely sort them out. Your smile is best antidote for your beloved’s unhappiness. Some co-workers would not like your way of handling certain important issues- but might not tell you- If you feel results are not as good as you had expected- it will be wise to review and alter the plans at your end. You will make commitment to the people who look up to you for help. Marriage had never been so wonderful before than today. Virgo:- Avoid discussing about your illness. Engage yourself in some work to divert your attention from ailment because the more you talk about your ailment the worse it gets. New sources of income will generate through people you know. To your surprise brother would come at your rescue. Your need to support and work in close coordination to make eachother’s happy. Remember cooperation is the main spring of life Avoid a hasty step in love. You will feel special at work today. Time to re-assess your strengths and your future plans. Your relatives might cause some harm your marital bliss today. Libra:- You will be loaded with energy and will do something extraordinary today. Your expenses might over exceed your budget bringing many ongoing projects to an abrupt halt. There may be opportunities to attend social functions- which would bring you in close contact with influential people. Your smiles have no meaning-laughter have no sound-heart forgets to beat as you miss the company Your hard work will be rewarded as you are likely to get a promotion. Don’t think about the monetary gains because in the long run you will be the beneficiary. Your communication techniques and working skills will be impressive. Your spouse might deny to satisfy your needs today, which will eventually make you feel frustrated. Scorpio:- Overall health will be fine but travel will prove hectic and stressful. Bank dealing need to be handled very carefully. Quarrel with a neighbour would spoil your mood. But don’t lose your temper because it would only add fuel in the fire. No one can quarrel with you if you non-cooperate. Strive to maintain cordial relations. One-sided infatuation will ruin your happiness. Stress at work may take a toll today. Try to become ignorant. Good day to visit a lawyer to take some legal advice. The day might get the warmth of your relationship with your spouse hurt. Sagittarius:- If you haven’t been taking sufficient rest then you will feel extremely tired and will need extra rest. Do not invest in joint ventures and dubious financial schemes. Visiting guests occupy your evenings. You will get to taste the rich chocolate of love today. Acknowledging you mistake on work will go in your favour. But you need to analysis how you can improve it. You should apologize to whom you have harmed. Remember everyone makes mistakes but only fools repeat them. Travelling will not bring immediate results but will lay down good foundation for future benefits. The internal beauty of your life-partner will ooze out today. Capricon :- Take care of your well being otherwise things might take a turn for the worse. Someone with big plans and ideas will catch your attention- Verify the credibility and authenticity of the person before making any investments. News of family secret may surprise you. Romance and socializing will rule your mind despite pending jobs. Things might turn really awesome for you at work today, if you just said a “Hello” to the one who hates you. Unexpected travel for some proves to be hectic and stressful. Today you will know the true ecstasy of being married. Aquarius:- Don’t take your life for granted realize that the care for life is the real vow. You will make money if you put your savings into conservative investments. Plan something special for your progeny. Make sure you plan some realistic so that you can achieve/execute them. Your future generation would always remember you for the gift. Try not to say anything harsh to your beloved-otherwise you may have to repent later. You will be honored for some of your good deeds today at work. You need to take extra care of your luggage if you are travelling today. Some of your works might get hampered today due to the disturbed health of your spouse. Pisces:- Friends will introduce you to somebody special who would have a remarkable influence on your thoughts. Incase you are looking for ways to make little extra money- invest in secure financial schemes. Your interesting attitude would brighten up the atmosphere at home and fill it up with good vibes. Don’t act like a slave in love affair. Daydreaming will bring your downfall- Do not count on others to do your work. Secondhand news should be verified. Your spouse might doubt your loyalty due to your hectic schedule, but the end of the day he/she will understand and give you a hug.